The family of former defense minister Mohamed Nazim has requested his transfer from prison to house arrest with an appeal filed over the 11-year-jail term on weapons smuggling charges stalled indefinitely at the High Court. Nazim’s brother, Adam Azim, said the family has written to home minister requesting the transfer. The appeal was stalled after the Supreme Court suddenly transferred two judges on the five-judge-panel to a newly created appellate branch in the south. Nazim maintains he was framed by rogue police officers who planted the pistol and three bullets in his apartment during a midnight raid. The trial was criticized for apparent lack of due process. Appeal hearings were set to conclude within a week in late-June. The transfer of judges was made in the middle of the appeal on June 23. 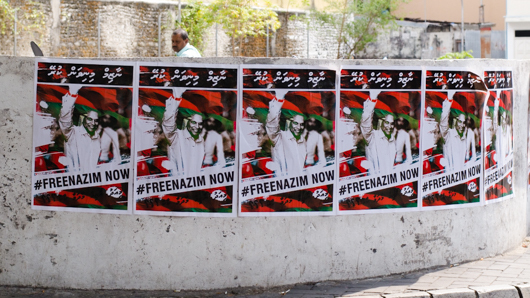 Nazim’s trial coincided with the terrorism trial of ex-president Mohamed Nasheed. The opposition leader was sentenced to 13 years in jail over the military detention of a judge during his tenure. The pair’s imprisonment sparked a political crisis with daily protests. With mounting diplomatic pressure, Nasheed was transferred to house arrest. Talks have now commenced between the government and Nasheed’s Maldivian Democratic Party (MDP). The MDP has requested Nazim be transferred to house arrest to allow political reconciliation. The largest opposition party has also requested the government withdraw terrorism charges against the Adhaalath Party president Sheikh Imran Abdulla. Imran was charged with inciting violence at a historic anti-government protest on May 1. 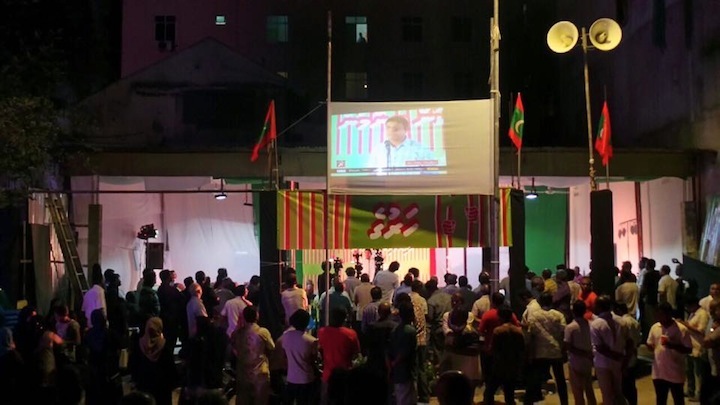 The Adhaalath Party allied with the MDP in March after President Abdulla Yameen told Imran he had no power to release Nazim. Home minister Umar Naseer told the press on Sunday that the government is open to exploring avenues to release jailed politicians and withdrawing charges. The government will present a paper at a third meeting on Wednesday night. While there has been progress on government’s talks with the MDP and the Jumhooree Party, talks with the Adhaalath Party has been stalled, with the party insisting Imran should represent it at talks. The main opposition Maldivian Democratic Party (MDP) has proposed transferring imprisoned ex-President Mohamed Nasheed and other political leaders to house arrest as “immediate steps to build trust” in a draft roadmap for political reconciliation. The paper also proposes negotiations on changing to a parliamentary system of governance and reforming the police and the judiciary. President Abdulla Yameen had called for separate talks with the three allied opposition parties, two weeks after a historic anti-government protest on May 1. He has, however, ruled out negotiations for the release of Nasheed and ex-defence minister Mohamed Nazim, whose arrests in February triggered the ongoing political crisis. Hundreds were arrested and injured in clashes on May Day. The national council is due to hold a second workshop tonight to discuss the paper, but Minivan News understand it will not undergo substantial changes. Adhaalath Party president Sheikh Imran Abdulla was meanwhile arrested last night ahead of the first hearing of his terrorism trial tonight, throwing the possibility of the talks going forward into doubt. JP deputy leader Ameen Ibrahim and council member Sobah Rasheed are also facing terrorism charges. Imran and Ameen were among the representatives of their respective parties for the talks. Stressing the importance of building and maintaining trust among all political actors, the MDP said imprisoned politicians must be transferred to house arrest, until the truth of the accusations against them can be verified. Along with Nasheed and Nazim, the MDP says former defence minister Tholhath Ibrahim and former ruling party MP Ahmed Nazim should also be transferred to house arrest. The latter pair were convicted of terrorism and corruption, respectively. The government must also withdraw charges against the opposition leaders and supporters arrested from protests, the paper said. The MDP also called for an end to “politically motivated” targeting of opposition-aligned businesses, including JP leader Gasim Ibrahim’s Villa Group, former MP Abdulla Jabir’s Yacht Tours, and the VA Company. The tax authority froze Villa’s bank accounts last month. Local media has said the criminal court has issued a warrant for Gasim’s arrest. The JP leader is in Bangkok at present. The government must also publicly disclose information gathered by Maldivian and foreign intelligence agencies regarding the murder of MP Afrasheem Ali and the disappearance of Minivan News journalist Ahmed Rilwan and launch independent investigations involving civil society organisations, the MDP said. Once the immediate steps have been taken, the MDP proposed negotiations for “a smooth and peaceful” change from a presidential to a parliamentary system of government. 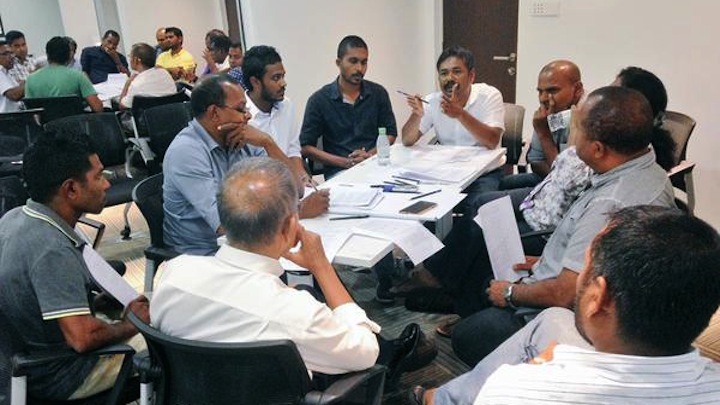 The paper noted that coalitions led by the MDP and the Progressive Party of the Maldives (PPM) won the 2008 and 2013 presidential elections, respectively. But both coalitions disintegrated soon after the polls. Coalitions between political parties are incompatible with the presidential system and the Maldivian constitution, the MDP contended, and would not lead to stability as the electorate is unwilling to grant a popular mandate to a single candidate or party. The party that holds a majority in the current parliament should form a government under the new system, the paper suggested. The ruling PPM and coalition partner Maldives Development Alliance controls a comfortable majority of the 85-member house. If the MDP’s proposal is accepted, the PPM will continue to lead the government. However, public referendums should take place to legitimise the decisions of several MPs who have switched parties since the May 2014 parliamentary polls. The MDP said the party believes that it remains “an easy task to change the government using the security forces” as a police and army mutiny had forced former President Nasheed to resign on February 7, 2012. In order to prevent a similar situation, the party recommended identifying the mutinous elements and soldiers, seeking reconciliation, and establishing trust and good will between the officers and the MDP. Among the steps for judicial reform, the party recommended changing the composition of the Judicial Service Commission, completing investigations into allegations of judge’s misconduct, and setting a university degree as the minimum qualification to become a judge. Other proposed measures included immediately enforcing the new penal code, passing an evidence law and criminal procedures code, and repealing amendments brought to the Judicature Act that saw the removal of former Chief Justice Ahmed Faiz Hussain and Justice Muthasim Adnan. The party also proposed amending the constitution to state that the Supreme Court would not have the authority to make laws and to allow an equal say for ruling and opposition parties in appointing members to independent institutions. Three men were arrested from an opposition protest on Wednesday night when they reportedly refused police orders to step out of the street and on to the pavement. 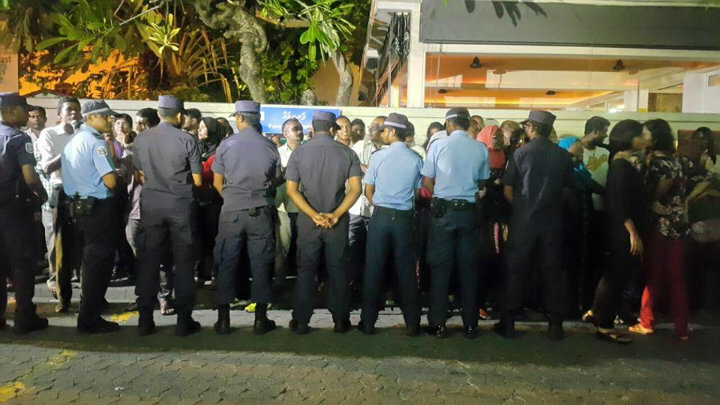 Opposition MP Rozaina Adam told Minivan News that police officers pushed some hundred protesters on to the pavements at the main junction of Chaandhanee and Fareedhee Magu. Three protesters were arrested for disobedience to order. “They are cracking down on our right to assembly and free speech. This is how rights are taken away in dictatorships, step by step,” she said. The allied opposition parties, the Maldivian Democratic Party (MDP), the Adhaalath Party and the Jumhoree Party (JP), are protesting over the imprisonment of ex-president Mohamed Nasheed and the ex-defence minister Mohamed Nazim, and the takeover of JP Leader Gasim Ibrahim’s businesses. A police spokesperson said the protesters had been told to stay on the pavements to avoid blocking traffic. Protesters were very cooperative, he said. The three men who were arrested remain in police custody. Since a 20,000-strong march on May 1, the police have banned the use of four-wheeled vehicles in protests. In April, police banned the use of sound systems beyond 11pm and protesting beyond 12am. MP Rozaina said the protest had ended at 11pm when the police ordered sound systems to be shut off. MDP Vice President Mohamed Shifaz said the police had prevented supporters from holding a demonstration on Monday as well. The opposition had protested peacefully every day from February 10 to May 1. Violent clashes broke out on May Day when protesters attempted to enter the city’s restricted Republic Square. Some 193 people and the three leaders of the allied opposition parties were arrested. Protests have slowed since then to just three or two days a week. The opposition has opened a campaign hall for its nightly activities and have announced a third mass protest on June 12. In a speech this morning, President Abdulla Yameen welcomed “non-stop protests” but said the government will not tolerate attacks on police officers. “To politicians, I say, we will not allow you to violate police officers, torch property and disrupt the peace. Political activities should be carried out, but it should stay within the limits,” he said. Two police officers were beaten on May Day. Some 14 people were arrested. At least three of the suspects have told lawyers police severely beat them and threatened to kill them. The president also condemned calls for a tourism boycott. “People who call for boycotting tourism in political turmoil are enemies of the country,” he said. The opposition alliance says its new haruge (meeting hall) opened in Malé last night will give renewed impetus to the ‘Maldivians against tyranny’ campaign. Addressing opposition supporters gathered for the opening, Jumhooree Party (JP) deputy leader Ameen Ibrahim said the opposition resume its activities with more passion and resolve with the meeting hall. The “song and melody” of the opposition alliance has not changed, Ameen said, and the parties were united through a common purpose. Ameen said forthcoming talks between the government and opposition could be fruitful if President Abdulla Yameen’s invitation for dialogue is sincere. The opposition parties will accept the invitation in the interest of peace and for the sake of detained opposition leaders and supporters, he said. While the three opposition parties will respond separately to the official invitations, Ameen said the “agenda” and stance of the allied parties are the same. President Yameen’s proposed agenda focuses on three aspects; political reconciliation, strengthening the judiciary and legal system and political party participation in economic and social development. President’s office spokesperson Ibrahim Muaz Ali, however, ruled out negotiations over the imprisonment of ex-president Mohamed Nasheed and ex-defence minister Mohamed Nazim. The pair’s arrest in February and subsequent imprisonment triggered the ongoing political crisis. The opposition alliance has staged mass demonstrations on February 27 and May 1 calling for their release. Some 30 protesters arrested from the May Day anti-government demonstration meanwhile cut ribbons at last night’s opening ceremony. The meeting hall is located in front of the artificial beach stage. A donation box has also been placed at the meeting hall to raise funds for the opposition cause. The wives of detained main opposition Maldivian Democratic Party (MDP) chairperson Ali Waheed and Adhaalath Party president Sheikh Imran Abdulla also attended last night’s rally. The opposition leaders were arrested in the wake of the May Day protest and accused of inciting violence against the government. Ameen said the pair were being held in solitary confinement in small cells at the Dhoonidhoo detention centre. Ali Waheed was suffering back pains because his concrete bunk was too small for his size, Ameen said. The former transport minister called on the president to cease the government’s alleged efforts to foster “a culture of brutality,” warning that President Yameen could be remembered as the “most brutal ruler” in the country’s history. MDP vice president Mohamed Shifaz said the opposition alliance will continue its activities until imprisoned politicians are released. Adhaalath Party council member Shidhatha Shareef questioned the sincerity of President Yameen’s call for talks as he had not accepted the opposition’s repeated appeals during the past three months. “President Yameen is not part of the delegation he assigned after calls for talks. We are calling for talks to resolve the serious political turmoil in the country. If the president of the Maldives does not have the capability to do it, I don’t believe he has the capability to be the president,” she said. The president’s office sent official invitations to the three opposition parties yesterday. So far, only the JP has officially accepted the invitation and assigned representatives for the talks. The opposition Jumhooree Party (JP) has officially accepted the president’s invitation for dialogue without conditions and assigned a four-member team to represent the party. The JP said in a statement today that it hopes “political, social, and economic problems facing the Maldives” can be resolved through discussions. President Abdulla Yameen had sent official invitation letters to the three allied parties today and appointed two ministerial teams to represent the government. The JP promptly informed the president’s office that its representatives are deputy leader Ameen Ibrahim, MPs Ilham Ahmed, Abdulla Riyaz, and Hussain Mohamed. However, at a press conference of the opposition ‘Maldivians against tyranny’ alliance this afternoon, Ameen questioned the sincerity of the president’s offer and called on the government to release detained opposition leaders and supporters. Ameen said the continuing detention of main opposition Maldivian Democratic Party (MDP) chairperson Ali Waheed, Adhaalath Party president Sheikh Imran Abdulla and JP senior member Sobah Rasheed is “unjust”. “If the calls for dialogue is sincere, the government’s unjust brutality should stop. Unless it is stopped, what is there to talk about?” he said. The opposition parties on Thursday had welcomed President Yameen’s call for talks, but had demanded the release of leaders arrested from the May Day anti-government demonstration. Adhaalath Party spokesperson Ali Zahir told Minivan News today that the party will make a decision after internal discussions. Ameen meanwhile noted that the opposition has repeatedly urged the government to hold talks to resolve the political crisis triggered by the arrest and imprisonment of former President Mohamed Nasheed and former defence minister Mohamed Nazim. While the government insists that the demands to release Nasheed and Nazim are unlawful and beyond the president’s constitutional powers, Ameen said calls for releasing detainees within legal bounds were not unconstitutional. Asked if the alliance expected a positive outcome from the talks, Ameen said the opposition has not lost hope, but would learn whether the government is sincere when the talks commence. Meanwhile, the criminal court yesterday extended the remand detention of Imran and Ali Waheed by 10 days and seven days, respectively. The pair were arrested with court warrants in the wake of the May Day protest and accused of inciting violence. Ameen was also arrested along with Imran and Ali Waheed, but the High Court last week overturned the criminal court’s order to hold him in remand detention for 15 days. All three were members of the alliance’s steering committee and had been on the front line of the May Day protest march. Ameen said the prolonged detention of the opposition leaders and protesters arrested from the demonstration is “unacceptable” as police have interrogated the detainees and concluded investigations. Imran, Waheed, and Sobah are kept in small cells apart from the rest of the prison population on Dhoonidhoo, Ameen said, adding that their punishment was similar to criminals serving 25-year jail sentences. The opposition leaders have met the police upon request, shared information, and do not have criminal records, he added, questioning how they were found to pose a danger to society. 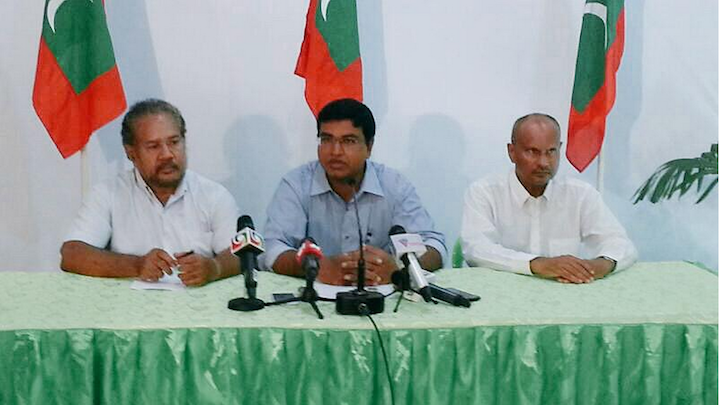 Malé mayor Mohamed Shihab said the MDP believes the detained leaders are “political prisoners”. The opposition and police have raised fears of violence at a mass antigovernment protest on May Day, as a political crisis triggered by the jailing of ex president Mohamed Nasheed deepens. The religious conservative Adhaalath Party has accused government ministers of planning to release convicts on Friday to incite violence as a pretext to crack down on protesters. The police meanwhile told opposition leaders they have received reports that the demonstration will not be peaceful, and have ramped up riot training exercises for its special forces this week. Tensions are high in Malé with the opposition Maldivians against brutality coalition vowing to bring 25,000 people out on to the capital’s streets demanding Nasheed and ex defence minister Mohamed Nazim’s release. But president Abdulla Yameen has labeled the opposition’s demands unconstitutional and has said he will not negotiate or resign on May Day. Adhaalath Party president Sheikh Abdulla Imran speaking at a rally in Malé’s suburb Vilimalé accused Tourism Minister Ahmed Adeeb of seeking the release of 200 dangerous criminals to “shed blood” on May Day. “Adeeb has sent a 200 strong list of the most dangerous and vile criminals to the courts seeking their release, in order to confront protesters,” said Imran. The sheikh has also previously accused Adeeb of corruption and illicit connections with gangs. Speaking to Minivan News Adeeb dismissed the allegations, saying the opposition must ask state institutions to investigate any allegations of wrong doing. “I don’t think they will be able to do much on May Day,” he said. “Even if its May 1, June 1 or that grand February 27, if you dare to confront us, come, this government stands ready,” Adeeb said. Over 10,000 opposition supporters took to the streets of Malé on February 27 following Nasheed’s arrest, but the rally was unexpectedly called off at 6pm when the police threatened a crackdown. Police are meanwhile continuing riot trainings for its Specialist Operations unit at Feydhoo Finolhu Island. 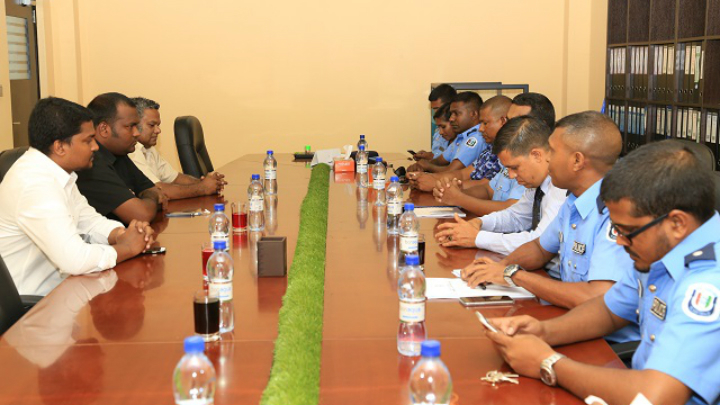 The police held separate meetings with the Maldivian Democratic Party (MDP) and the Jumhooree Party (JP) yesterday, according to a statement. Superintendent of police Abdulla Shareef told MDP chairperson Ali Waheed that opposition politicians were inciting violence at daily protests and threatening the country’s independence and sovereignty. He said the police will take actions against any acts that violate rights. 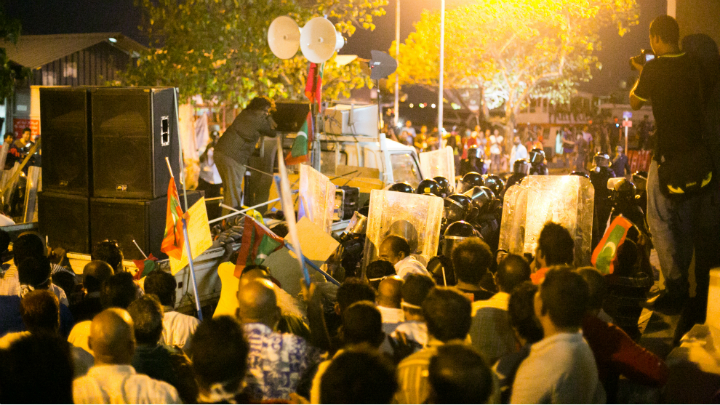 The MDP and JP however assured the police the protest would be peaceful and will respect the law, the statement said. The newly formed “Maldivians against brutality” alliance is launching its activities at 9:00pm tonight at the artificial beach. Adhaalath Party (AP) President Sheikh Imran Abdulla made the announcement on behalf of the “national movement” at a press conference this afternoon, but declined to reveal any details of the activities planned for tonight. Imran said the alliance has formed a 13-member steering committee to plan and oversee its activities, which includes representatives from the opposition Maldivian Democratic Party (MDP), Jumhooree Party (JP), and NGOs. He also repeated allegations of corruption against Adeeb, claiming that the PPM deputy leader gifted a US$70,000 BMW car and US$100,000 gold ring to First Lady Fathmath Ibrahim. Adeeb has denied the allegations, claiming the MP had been bribed to defame him and President Abdulla Yameen. 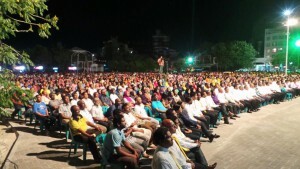 Formerly bitter political rivals united against the alleged “brutality” of President Abdulla Yameen’s administration at the first rally of the opposition Maldivian Democratic Party (MDP) and Adhaalath Party (AP) alliance tonight. Addressing a crowd of thousands at the carnival area in Malé, all speakers at tonight’s rally – including AP President Sheikh Imran Abdulla, ‘Sandhaanu’ Ahmed Didi, former ruling party MP Ahmed Mahloof and MDP leaders – stressed that they bore no grudge against each other. President Yameen’s “brutality” included the jailing of the former President Mohamed Nasheed after an “unfair” trial, the “framing” of former Defence Minister Mohamed Nazim, the targeting of Jumhooree Party (JP) Leader Gasim Ibrahim’s businesses, and the “unconstitutional” removal of former Auditor General Niyaz Ibrahim and former Chief Justice Ahmed Faiz Hussain. The current administration was also accused of rampant corruption and using criminal gangs to attack peaceful opposition protests after assuring wayward youth immunity from prosecution. Several speakers suggested that the prevailing atmosphere of fear was unprecedented, but expressed defiance in the face of threats from government-backed gangs. AP President Sheikh Imran said toppling the government was not the alliance’s intention and called for President Yameen to join “peace talks” with the opposition. “Choosing another way is in President Yameen’s hands,” he said. In a symbolic gesture, a chair in the front row was kept empty for Nasheed, who was convicted of terrorism and sentenced to 13 years in prison last Friday (March 13). As the Maldives National Defence Force’s (MNDF) official anthem song was used in between speeches, the defence ministry promptly put out a statement objecting to its use in a political rally. “This institution believes that the use of the song for political purposes undermines the honour and dignity of the army,” the statement read. MP Ibrahim Mohamed Solih, MDP parliamentary group leader, assured JP members that the party was “standing up in [Gasim’s] defence.” Last month, Gasim’s Villa Group was ordered to pay the state US$100 million allegedly owed as unpaid rent and fines in 30 days. As the government gears up to celebrate the upcoming golden jubilee of independence, all speakers contended that the Maldives was not free. “Maldivians do not have independence as we celebrate 50 years of independence. 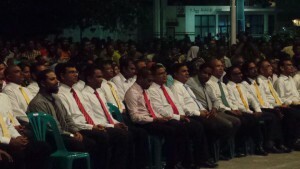 Tonight, we start the fight for independence,” said JP Deputy Leader Ameen Ibrahim. 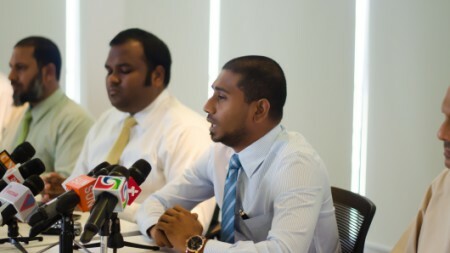 MP Ahmed Mahloof – who was expelled from the ruling Progressive Party of Maldives (PPM) – said the controversial transfer of presidential power on February 7, 2012 spawned bitter divisions in the country, which appeared far too wide to ever be bridged. He urged PPM supporters to consider why he would withdraw support for a party he had helped found and a president he had helped elect. President Yameen after assuming power sided with gangs and repeatedly violated the constitution, he claimed. Alleging corruption in the government, Mahloof said Tourism Minister Ahmed Adeeb bought a US$80,000 BMW and$100,000 ring for the first lady on her birthday, indicating President Abdulla Yameen encouraged embezzlement of state funds. “Why? Because I know the atrocities this government has committed. This government is capable of such atrocities. I am now uncertain of my security,” he said. In his first speech at a political rally, Adam Azim – former Defence Minister Nazim’s brother and former managing director of the State Trading Organisation (STO) – said he was not at the rally solely because his brother was under arrest. “I’m here because I do not want my children or their children to live in this fear,” he said. Azim praised former President Nasheed for his courage, determination, and lead role in ushering in democracy. Expressing gratitude to the opposition leader for standing up in defence of Nazim – who had played a pivotal role in Nasheed’s resignation in February 2012 – Azim said Nasheed’s heart was “big enough” to contain the whole country. He said Nazim wishes to serve the public as Nasheed does and did not fear jail, calling on police and the military not to obey unlawful orders. Azim also expressed concern with the dismissal of employees of state-owned enterprises for attending opposition protests and rallies, noting that their politically-appointed superiors were at the front lines of ruling party gatherings. MDP Chairperson Ali Waheed meanwhile said President Yameen has betrayed and alienated his closest associates and allies, including former Defence Minister Nazim, who he said was the hardest working and most competent cabinet minister, and PPM MP Ahmed Nazim. The Supreme Court is currently hearing an appeal by the Prosecutor General’s Office into dismissal of corruption cases against the Dhiggaru MP. Parties on opposite ends of the political spectrum were setting aside ideological differences against President Yameen’s alleged attempts to destroy the multi-party system, he said, which has renewed hope and courage for the opposition. The MDP’s top priority and the goal of the opposition movement was freeing Nasheed, he declared. “We want to see the day Nasheed arrives at Republican Square a free man,” he said.